65 posts categorized "Gratitude Friday"
Being a nana is simply the greatest! Yep, I missed posting. Twice. Only six days into the month of daily postings and I miss a day. Then another. I have no real reason other than I'm not that great with time management and multitasking and I have a crappy laptop that has been acting up. There you have it, too many projects in the works but none finished makes for a tired blog author with nothing to write about at the end of the day. I won't even bore you with my laptop issues. I'll just say it was a cheapo when new, and I'm afraid I've likely squeezed my money's worth out of it. This post isn't about whining though, it's about being grateful, being thankful, being aware of the blessings in my life and hopefully encouraging others to do likewise. I'm grateful for my problems. What?? Yes, you heard it right. Sometimes when I'm feeling sorry for myself all I have to do is stop for a minute and adjust my perspective. I've been feeling a bit crazy lately. Not one room in my house is clean. I've said it aloud in frustration, "I wish just one room in this house was clean!" Grrr..... It all begins in the garage and the health code violations just continue to mount from there. Less than sparkling toilets, cluttered counter tops, unmade beds, a dining room that looks more like a storage closet and lets not talk about the floors please... the list goes on and on. 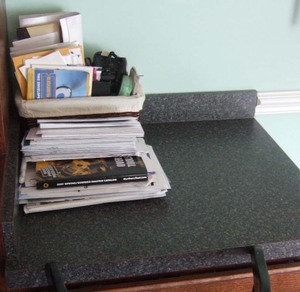 I never have a spotless, sparkling clean from top to bottom house, but I need things to be somewhat straight. It stresses me greatly when my surroundings are out of control and friends, this week, I've been feeling stressed. STRESSED! But then I take a moment, take a deep breath ask myself why. Why are things so chaotic around here? Because a toddler spends a great deal of time around here, that's why. Would I rather my house be sparkling clean and toddler free or be a total wreck and echoing with little girl giggles? It's not even a question worth asking. Give me those giggles, any day of the week. One day my house may be in order, and I fear it will be a lonely time. A quiet time and I don't want that. I want a busy little girl running from room to room. I want her mama chatting on the porch. I want her uncle sleeping late and leaving his clothes on the floor. OK, so I don't really want that last one, but hey, if it means my 20 year old Marine is stationed close enough to come home most weekends, I'll thank the Lord and get over the clothes on the floor. Yes, my sewing room is a complete disaster, but how many people would love to have the luxury of having a whole room devoted to their hobby? Laundry is piling up because I have more clothes than I need. Dishes are dirty because I have plenty of food to eat. This week my life is messy and chaotic and filled with more blessings than I count. I hope yours is too. You see, much of what feels like problems, if you take a moment and view things from a slightly different angle, you'll see not problems, but rather the byproducts of a life filled with blessings. Way back in the day, when I actually blogged on a regular basis, Fridays were dedicated to reflecting on the blessing in my life. I am going to try posting every day this month. Gasp! How will I go from posting a couple, maybe three times a month, to daily? I don't know, but I'm going to try. I may only post a photo with a word or two, but hey, if I'm going to pay every month to keep this space, I need to actually use it, right? Let's get this party started with some happy thoughts. First of all, I'm so happy that after a summer that seemed to go on forever, autumn has finally made an appearance. Oh my what a gift she has been. If you had told me when I started this blog that in a couple of years I'd be proudly calling myself Nana, I'm not sure I'd have been happy about the prospect. Now I can't remember life before her. She fills up my heart in a way I never knew was possible. She makes me feel younger and happier and brighter and just better. The past couple of years have been filled with changes. Changes I could never have predicted. I'm a nana. My babies are grown and have jobs and are living life as grown-ups. How did that happen? Casey is loving life as a Marine. Something I wasn't happy about in the begining, but has been a blessing. Alyssa loves her job as a psych nurse. Again, not a path I ever expected her to take, but she knows it was what she was meant to do. It makes this mama so grateful! They fill my heart I tell ya! My heart overflows. For that I am so, so grateful. Happy Friday friends! See you back here tomorrow. Monday: Took Bayleigh to Duke for a follow-up. Great news, the reflux has resolved, no more follow-ups needed. Yay!!! Tuesday: Got my hair did by my beautiful and talented niece Jessica. Wednesday: Worked a little spray paint magic on some beat up old restaurant chairs I thrifted for 5 bucks a piece. For fun I stenciled the numbers 1 through 4 on the backs. Can't forget Bayleigh's seat. This old high chair belonged to my mom and Alyssa and Casey used it when they were small. Thursday: We picked up Casey at the Airport in Jacksonville. He's been assigned to New River Airstation, less than 2 hours from home. How great is that?? Today, I sit here full to the top and overflowing, thanking God for His many blessings. Have a lovely weekend, friends! I am grateful for the sense of contentment I have with my life. That's not to say I don't have things I would love to change, circumstances that are less than ideal. Boy do I, but they are just that, temporary circumstances, bumps in the road. As for the foundation of my life, the blocks that make up the house of Autum, I'm completely happy. I'm happy that I live in a quiet little town with the love of my life my kids and a herd of animals. I'm happy that I was raised by my Christian grandmother. I am happy that I am a southern girl, a wife, a mom, a sister, aunt and niece. I'm happy to teach Sunday school at the same church I've attended as long as I've been alive. I'm happy my in-laws love me like a daughter. 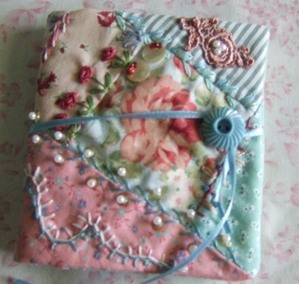 I'm happy to have found blogs and to be part of this wonderful community of creative souls. I'm happy to be left-handed, hazel-eyed, and five foot four. I don't look at the life of anyone else and wish to change places. I know there are souls who are painfully uncomfortable in the life they live, out of place in the world in which they live, unable to find contentment. I am so grateful for the little spot in this universe I happen to fill and for those who keep me company. Left Brain, Right Brain.... or is it half brain? I'm not sure which it is that I am, the latter I suspect. I'm certainly not tech brained. That's why I've put off and put off doing something about my poor computer. It's been teetering on the edge of death for much too long. I did break down and buy an external hard drive to save what I could from the sinking ship with the plan to completely reformat or whatever the correct term is for wipe clean and start over. The wiping clean part wasn't hard. Starting over has been excruciating. One crucial little aspect anyway, connecting to the internet. Last night I was live chatting with Dell support and I swear, she left me. No warning, just left. I have to give her credit, she did spend a lot of time with me, and I still don't know if I sent her right over the edge or what. Without babbling on more and further solidifying what a dummy I am, I'll just say, I fear I need a new network adapter card or something like that. All that blabbering about was to say, I was feeling a serious crafting mojo coming on and have been derailed by stupid computer problems. Bla!!! It's cold here, so I'm going to make soup for dinner and tomorrow I'll play Scarlett and not think about my non-existent network adapter card.. or driver or whatever. I hope that crafting mojo will still be around. ~friends (that would be you Kelli) who are tech brained and helped me with a temporary fix. ~I'm going to be a grandma- it's still sinking in and getting more exciting everyday. I think it's a girl- just a feeling. ~Thanksgiving- can you believe it's less than a week away? My sister has her Christmas tree up already...crazy! Sorry for the post w/o pix. Computer problems, remember? Gratitude Friday, it's been too long. It really has been too long since my last GF post. I've been busy with this or distracted by that or just plain not feeling all that grateful, something I'm not proud to admit considering how blessed I really am. The simple act of counting those blessings has a way of shifting perspective and making me look at things in a different light. The tease of fall in the air. I felt it tonight, just a hint, but an oh so welcome hint. 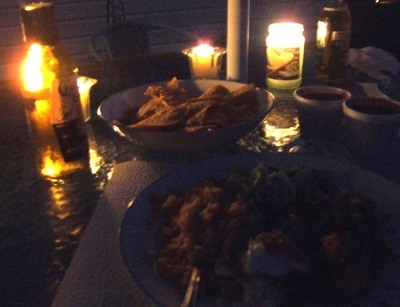 Enjoying a meal of Mexican take-out on the deck by candle light with a canopy of stars overhead. Just me and my sweetie. Just me and my sweetie and four pups. Me, my sweetie, four pups and two cats. It was lovely. A really good sermon last Sunday about wishes. If you could have one wish what would it be? Only one wish. Solomon wished for wisdom. I've been thinking all week, what is my one wish for this life? Reading all of your wonderful Granny suggestions. Alyssa and I have read them together and enjoyed each and every one. I have a feeling, like many of you said, it will be chosen for me. Whatever she or he calls me will be the sweetest name I've ever heard. Thank you for sharing your stories with me- with us. 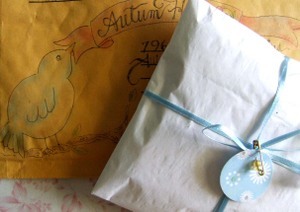 Sweet mail from Dawn, who was a winner in my 300 post give-away. Look at the artwork on the envelop. So much detail. Dawn, it is amazing. Thank you!! 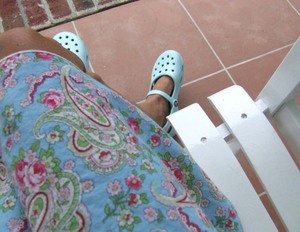 Sitting on the porch with my sweetie, enjoying an afternoon shower and admiring my new Crocs. Watching Casey drive off to pick up his date (also named Casey) for his first real date on the day he got his license. Hearing the car pull into the drive on time when Casey got home from his first real date. A quiet dinner, just me and my sweetie. A phone call from my girl. My happy girl. New to me sewing books from the used book store. Enjoy your weekend. I hope it's full of happy thoughts. Gratitude Friday: Boy do I have problems, and I'm grateful. I started the day a little grumpy, slightly irritable. Ever happen to you? No real reason, just feeling kinda like Oscar the Grouch. It think sometimes caffeine does that to me. For no reason at all, the smallest thing bugs me. 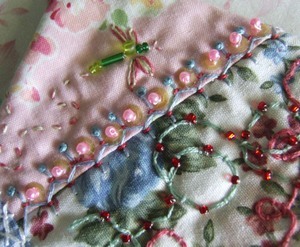 I started to do some sewing but couldn't get into the groove. I couldn't find the scissors. Couldn't remember which pile the fabric I wanted was in. Aaarrrgggg!! 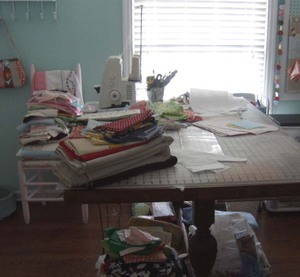 I had a little email conversation with Anna about folding fabric and how my fabric shelf is very neat and tidy, only because every piece of fabric I've used or thought of using or purchased for the past month is piled and stacked on or around my sewing table. The chair in the corner is stacked with piles of fabric my aunt gave me that I have no room for. The mess and my already grumpy state did not make for a good sewing state of mind. 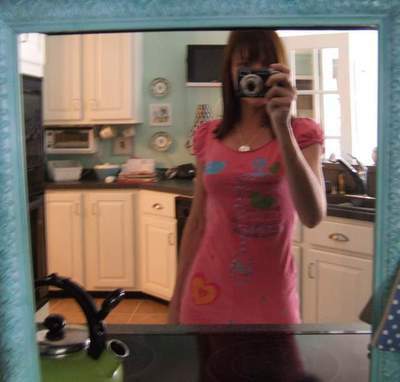 I walked through the house, grumbling under my breath. Aggravated that the kid's bathroom is so dirty, annoyed that they are still in bed and their rooms are disaster areas. Then it hit me. All the things that are annoying me, all the problems I seem to be having are actually signs of how good I really have it. If I stop and think about it, I don't have a problem in the world that someone, somewhere wouldn't love to have. It's all about perspective. The age old glass half full or half empty question. 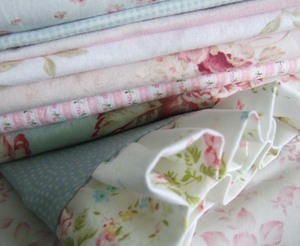 How blessed I am to have a room to sew in and plenty of fabric to choose from. Plenty. I have plenty of everything I need and what at times is viewed as a problem, is just evidence of a life full of blessings. My laundry basket is overflowing because I have plenty to wear. My refrigerator is way past due for cleaning out because I have plenty to eat. 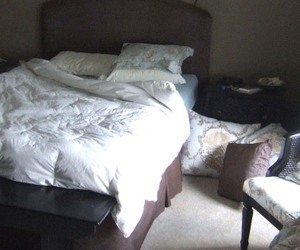 My unmade bed means I have a soft warm place to sleep tonight. Those kids sleeping late in their disaster area rooms are healthy and safe and the tragic events that have happened recently make me all too aware of how much of a blessing that is. This stack of bills and mail that need attention....I'll have to get back to you on that one. Sure, I have more serious issues that I'd love to have just disappear, but all things considered, I have a pretty darn good life, problems and all, and for that I am very grateful.